The name of Tantalus is a relatively famous one from Greek mythology, and still recognisable today, for the name of the king gives rise to the English word tantalise. Tantalus was the son of the god Zeus, born to the nymph of Mount Sipylus, Pluto. Tantalus was a favoured son of Zeus and was given the region of Sipylus to rule. The kingdom of Tantalus would get a queen when the king wed Dione, one of the Hyades, and therefore a daughter of the Titan Atlas; occasionally, Dione is replaced in mythological tales by a Naiad, either Eurythemista or Euryanassa. Tantalus would subsequently become father to three children, a daughter named Niobe, and two sons Pelops and Broteas. As a favoured son of Zeus, Tantalus was an often welcomed guest at the banquets of the gods, but just like another welcomed guest, Ixion, Tantalus did not recognise how lucky he was. Misdemeanours would start to mount up against Tantalus, for the king would often return to the mortal world and spread gossip about what had been said at the banquet tables. Then Tantalus would also attempt to steal some of the ambrosia and nectar served at the banquets, possibly in an attempt to make himself immortal. 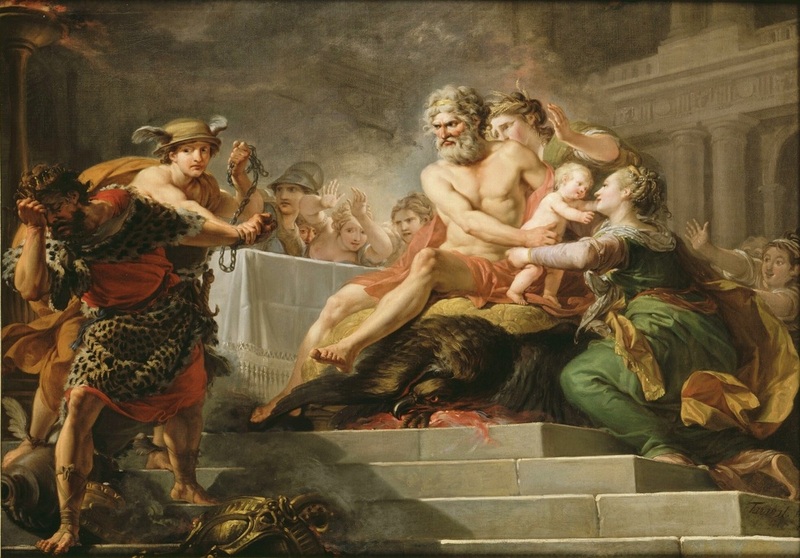 Tantalus was also accused of stealing a golden dog crafted by Hephaestus. The worst crime committed by Tantalus though occurred when the king invited the gods to a banquet hosted by himself. For some unknown reason Tantalus decided to play a trick on the gods, and the king killed his own son Pelops. The body of his son was then cut up, cooked, and then served as a meal to the gods. Most of the invited gods realised what was occurring, but at the time Demeter, was distracted for her daughter Persephone was in the realm of Hades, and so Demeter took a mouthful of the offered food. An angered Zeus order the Moirai, the Fates, to resurrect Pelops. The Moirai did this by re-cooking the meal in a magical cauldron, but it was soon discovered that a part of the shoulder of Pelops was missing, Demeter having eaten it. To replace the missing body part, Demeter would have Hephaestus craft a replacement from ivory. Tantalus would be removed from his throne by Zeus, and Pelops placed upon it in his place, but then Zeus meted out eternal punishment to Tantalus. 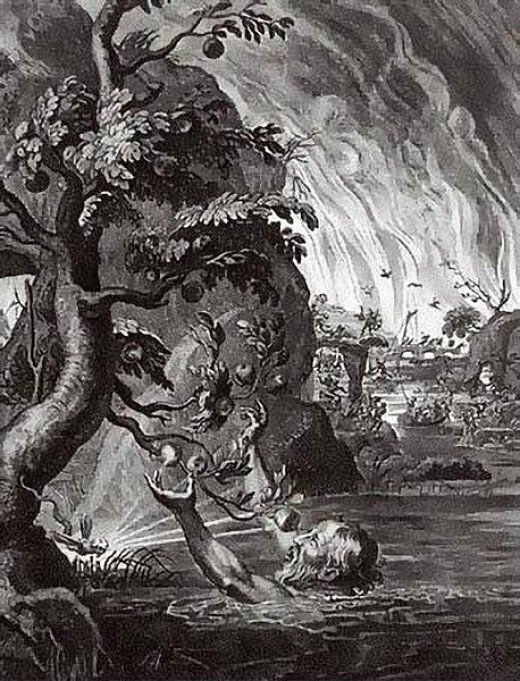 Tantalus’ crime of infanticide and cannibalism were some of the most horrendous considered in Ancient Greece, and so it was only fitting that Tantalus would be punished for all times in ﻿Tartarus﻿, the hell-pit of the Greek underworld. The punishment of Tantalus was witnessed by Odysseus when the Greek hero descended into the realm of Hades. For all eternity, Tantalus would be made to stand chin deep in a lake of water, whilst above him was an orchard of trees bearing every conceivable type of fruit. Also above Tantalus was a perilously balanced stone. Every time Tantalus leant forward to drink of the water of the lake, the water level would recede out of reach, and every time Tantalus reached upwards, wind would blow the branches of the trees out of his reach again. So for all time Tantalus would go hungry and thirsty, tantalised by the food and drink just out of reach. The stone above him would also provide eternal worry, a fear that the stone would one day overbalance and fall on the former king. Tantalus’ family line would be punished for generations afterwards for the crime of the king, for the House of Tantalus is also the House of Atreus, a family line which was famously cursed by the gods. Punishment was meted out on the children of Tantalus for their own crimes, as well as those of their father. Broteas would burst into flame when he slighted the goddess Athena. Niobe would rashly boast that she was a better mother than the goddess Leto, and her 14 children would be subsequently killed by Apollo and Artemis in retribution. Niobe would then be turned into a weeping stone. Pelops would succeed his father as king of Sipylus but was driven out when Ilus invaded with an army. Pelops would travel to the Peloponnesus, the region taking his name, and would marry Hippodamia. Pelops though would curse the family line further though, for he would cause the murder of his potential father-in-law, and kill his accomplice in the crime. Grandchildren of Tantalus would come via Pelops, for Hippodamia would give birth to Atreus and Thyestes. These two grandsons would be sent into exile when they killed their half-brother Chrysippus. Atreus and Thyestes would come to rule Mycenae, but a disagreement between the two resulted in Atreus killing the sons of Thyestes and serving them as food to his brother. Atreus would be killed by his own nephew, and the curse would pass along to two great-grandsons of Tantalus, Agamemnon and Menelaus. Agamemnon would be killed by his own wife, Clytemnestra, who was then killed by Orestes, the son of Agamemnon. Orestes would eventually end the curse, after he prayed to Athena, but he still had to face the court of the Erinyes.